I attended the 2012 USA Memory Championship in New York City on March 24 as an observer. Here is a writeup of the event. These are the scores that were announced during the event, so check the official website for possible updates. Apologies in advance for any possible mistakes and for events without complete descriptions–I’m jetlagged and running on little sleep at the moment. Competitors are given 15 minutes to memorize and 20 minutes to recall. Nelson Dellis came in number one in this event with 163 points. Hannan Khan was second with 158 points, and Michael Glantz, the US record holder, came in third with 150 points. There was a glitch in the scoring, so it first appeared that Nelson wasn’t in the top five. After his score was corrected later in the morning, he moved to the number one spot. This event is done in two rounds. There are five minutes for memorization and 10 min for recall. In the first round, Nelson was ahead with 173 digits memorized. In the second round, Nelson then broke his own US record of 248 digits with 303 digits using a 3-2-2 digit PAO system in a memory journey through a house in the Bahamas. I think that Ron White came in second with 136, and Brad Zupp third with 120. Mental athletes have 15 minutes to memorize a previously unpublished poem, with 20 minutes to recall it. Capitalization and punctuation count. The title and author have to be memorized too. Hannan and Michael tied at second with 213 points. Nelson scored 233. In this event, mental athletes have five minutes to memorize a deck of playing cards. There are two attempts, and the lower score is discarded. Nelson came in first with 1:27, Ron White second with 1:47, and Brad Zupp third with 2:06. After lunch, there was a speaker named Majid Fotuhi with a presentation on 3 Steps to Grow Your Brain. It was about physically increasing the size of one’s brain. The hippocampus is where memories are created. The hippocampus starts to shrink about 0.5% per year at age 50. Get fit – your brain needs a lot of blood. Better fitness is associated with a larger brain. Walking just 45 minutes three times per week significantly increased the size of the hippocampus, even after three months. More exercise, more new brain cells. It should be a workout with exertion. Tease your memory – mind training. New memories, new synapses. Eat well – avoid obesity. Have DHA in your diet—he recommends 1000mg per day. Six months of DHA can help someone perform at a level three years younger. He may have been affiliated with the sponsor, which was a producer of DHA products. I will read more about DHA studies when I get a chance, because it sounds interesting. The contestants were given up to 15 minutes to memorize random words. In the meantime there were a couple of memory puzzles on stage to entertain the audience. For example, volunteers from the audience had to memorize a sequence of shapes and colors something like: turquoise square, green triangle, yellow parallelogram, pink pentagon, lavender sun, red circle, blue hexagon, black star. Another puzzle was to examine a model of a brain, take it apart, and then reassemble it. The eight finalists then returned to the stage to go around and recite the words one by one in a elimination round. After three contestants were eliminated, the remaining competitors went to the next round. Five “tea party guests” got up on stage and gave information about themselves for no more than 30 seconds. I think the contestants also had written copies of the information. While the contestants were in the back, Joshua Foer got up and spoke a few words. Chester Santos then gave an impressive demonstration of how he has memorized all the congresspeople in the US, their political parties, their district numbers, and the committees that they sit on. The audience called out the name of a congressperson, and Chester would tell the audience about the politician. This was a great presentation of a real-life application of memory techniques. Each contestant gets three strikes before elimination. The tea party round looked really tough. The audience was loud and enthusiastic, and the spotlight was on the competitors. Four competitors returned to the stage for the final showdown: Michael, Ron, Hannan, and Nelson. At the end of the first deck Michael, Ron and Nelson were left. Michael had only memorized one deck, so that left Ron and Nelson. Ron made one guess at a card that he was uncertain about. He said that he was seeing an image of a truck, but that there was no truck in his card system. He got the card value correct, but missed the suit, and Nelson became the 2012 USA Memory Champion for the second year in a row. 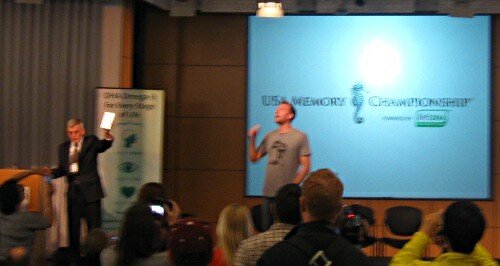 UPDATE: Watch some videos of the 2012 USA Memory Championship. I didn’t write down the scores from the Hershey High School Team, but they did really well, and it was great to see them scoring so well, and even holding US memory records. I was surprised at the number of observers. It was good to see many people there. They actually had to turn people away at the door. I would have found all the cameras distracting. They add another element of pressure to the event. In that aspect, it was different from the 2010 UK Open Memory Championships that I attended. I think I will bring goggles if I compete in the 2013 event. Sitting in the audience during the event, I was really wishing that I were competing, but I didn’t register in time and haven’t been able to train anyway, because life has been too busy. I’ve been on the road for most of the past year. In the past month, I traveled from Europe to the Middle East, back to Europe, San Francisco, and then New York. It has been really crazy. Congratulations to Nelson Dellis, and all the mental athletes that competed! I attended today’s U.S. Memory Championship for about 2 hours. The event was absolutely incredible! People from all walks of life participate. I started a conversation with Dana Hamilton, from Hershey, PA, who was competing in the event with her son. She was one of a group of mothers from Hershey who decided to participate to improve their memories, and not necessarily to win. Although she did not win, I thought she was very courageous to participate. During the playing card event, the moderator asked for volunteers to turn over a player’s “control” deck to see if every card matched in order. Not knowing anyone at the event, I walked up to Ronnie White, said “Hi” and started turning over the cards. He nailed all 52 cards twice! We spoke for a few minutes and he was kind enough to give me his e-mail address to reach out for some memory tips. Only when I returned home and looked up his name did I realize that I shook hands with the 2009 and 2010 Memory Champion. Ronnie said he did no training this year and came to New York to do the best he could. And he came in second place! All that said, I share Josh’s comments that the photographer’s were annoying and bothersome. Many times I saw one shove a camera into a participant’s face while they were actively working. My impression is that the event is poorly organized and not well-managed. I never thought two house of sitting could be so exciting. I will certainly be there in 2013 and encourage others to join me. I thought the organization was good, but there was at least one cameraman who was so intent on his video that he wasn’t aware of how distracting he was being to some of the competitors. I think I would bring blinders. I’m not sure why none of the competitors had goggles. I was not there nor have I ever heard of it but it sounds amazing!!!!! I wish I knew about this before! To see them memorize everythig in person would be so interesting!!! I wish I had the memory these people do. That would be incredible. I do not know much about how these geniuses do it but I have watched a guy memorize things on a youtube video by assigning a picture for with certain colors for each. I really think these people should more recognition for their talents. I love the part where the competitors were right and the cards weren’t in the right order Josh. Lol. I’ve had that happen to me. A few years ago my brother in law was firing numbers at me from the periodic table. He said I was getting them all wrong. I insisted that the book must be wrong but, having a science degree and being familiar with the names, he was having none of it. I eventually had to get another book to prove it to him. If you’re going to buy an encyclopaedia, don’t get the Hutchinson’s 1998 one because it’s full of errors wherever there is any kind of list. Josh is right Kayla. You may think the competitors are gifted but, the fact is that they have the same brain as you. You can learn to memorise a list of things in order in a matter of minutes with the right training. The disc set Josh mentioned is as good as he says. If you want to learn then, it makes sense to learn from the best and Dominic O’Brien has won the world memory championships eight times so I think that qualifies him to teach you. Also, go on Facebook and type in memory champion in a search. Join or ‘like’ the various groups and you will learn a lot about it as, competitors often discuss how they remember things. Thanks for writing this up, Josh. I was one of the competitors (as part of the press too), but had to leave before the second part, so I’m really glad to hear your recap. I was lucky to have gotten some tips from Nelson himself going into the competition, but only trained for a couple of days as a guinea pig ;). It was a fun event though! Great write up and summary, I wished I could have been there ever since I read Moonwalking with Einstein but I was at DrupalCon in Denver, which was bittersweet! Next year I will definitely attend, it was good to know that they were turning people away at the door. I will have to come early next year!